A recent study confirmed that while 91% of Americans have access to recycling plastic single use bags locally, most do not. The study was conducted by Moore Recycling Associates Inc. and focused on flexible polyethylene film, of which disposable plastic bags are made. It turns out there are over 15,000 locations throughout the United States where disposable plastic bags can be dropped off for recycling. Most of these designated drop-off locations are at stores. Many major retailers, such as Target and Wal-Mart, place bins near the door where shoppers can deposit their old bags as they make their way into the store. The study also determined that most Americans do not take full advantage of recycling opportunities when it comes to plastic bags. There are two issues at play that cause this outcome, convenience and knowledge. In order for people to recycle it must be convenient. There are sure to be some diehards who will go out of their way to recycle, but most people either cannot be bothered or just do not have the time to go beyond their routine. Stores are a central location everyone frequents which makes them an ideal place to collect bags for recycling. Possibly the reason plastic bag recycling rates are so low is a lack of consumer knowledge of the availability of the programs. Collection bins are useless if most people do not know where to find them or if they even exist. The next step to increasing recycling is education. Efforts need to be made to let shoppers know how and where to recycle. By spreading the word people will develop the habit of bringing their old plastic bags with them when they go to do their shopping, so they can drop the old bags off. 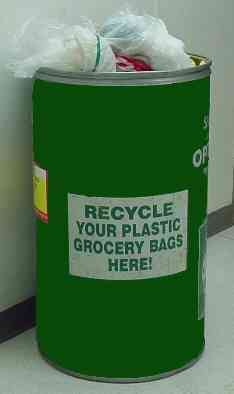 Stores can run campaigns to let shoppers know where the collection bins are located within the store and explain what types of bags are accepted. Unfortunately, this information is not readily available and that contributes to the low recycling rates. disposal needs of the outer cardboard packaging, the plastic tray that holds the food, and the plastic film that covers the food. These labels also include all relevant information, like whether or not items need to be cleaned, and the labels feature a web address so consumers know where to go if they have questions. The group behind How2Recycle also created a special label just for plastic bags in an effort to increase bag recycling by giving the consumer the information they need to properly dispose of plastic bags. Stepped up recycling is definitely the way to go. Properly disposing of plastic bags and other types of trash are key to reducing litter and managing our planet in a smart and environmentally responsible way. A solution that is better than recycling is going reusable. Reusable shopping bags eliminate the need for disposable bags and are better on the environment. Think about depositing your plastic bags in the nearest recycling bin and picking up some reusable bags the next time you go shopping. Reusable bags can be used for just about anything and deliver long term, dependable results, so you may find you like them more than their disposable alternatives. Dumping your disposable bag habit lessens the demand for plastic bags, so over time less will be manufactured. Recycling is great solution for the bags currently out there, but lessening demand means less plastic bags are produced and that would be a great turn of events. You should most certainly recycle any plastic bags you have, but seriously think about picking up some reusable grocery bags to do right by the planet. Go to https://www.americanchemistry.com/Media/PressReleasesTranscripts/ACC-news-releases/Study-Over-Seventy-Percent-of-Americans-Can-Recycle-Plastic-Bags-and-Wraps-Locally.html to learn more about recycling of plastic bags. Head over to http://www.how2recycle.info/ to learn more about the How2Recycle initiative. Does Passion Fuel Your Business?